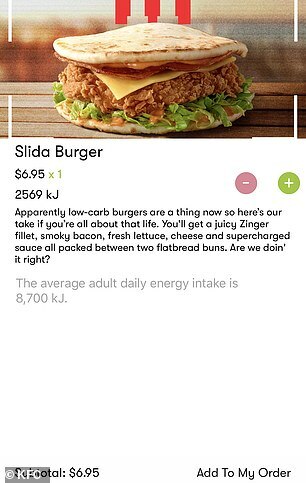 KFC Australia has unveiled another off-menu item just weeks after foodies discovered a little-known feature hidden in the fast food chain’s app. 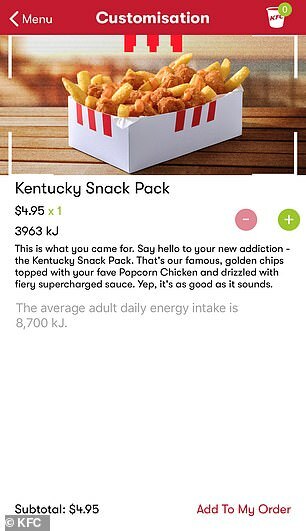 The restaurant added the never-before-seen meal called ‘The Kentucky Snack Pack’, retailed at $4.95, to the ‘Secret Menu’, available in-stores from Tuesday, April 16. 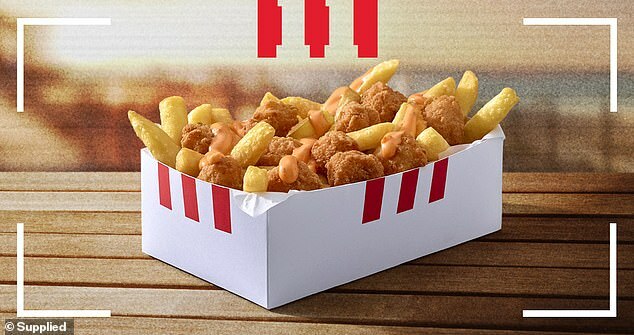 The new meal includes the famous golden fries, topped with its iconic Popcorn Chicken and drizzled with fiery supercharged sauce to give you a spicy kick. To make the purchase you need to download the app, select your nearest store, tap ‘order’ and when the menu appears, drag the screen down. 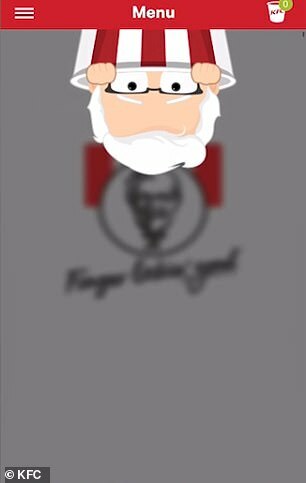 As cartoon Colonel Sanders appears, hold the screen for 11 seconds until the ‘Secret Menu’ pops up. ‘It didn’t take long for fans to discover our Secret Menu, and we’re excited to give the country a sneak peek of the next item, the Kentucky Snack Pack,’ KFC Australia’s chief marketing officer Kristi Woolrych said. The products on the Secret Menu were designed by the chain’s team members as part of an internal competition. ‘After all, no one knows KFC better than our people! The best ideas were chosen to become part of KFC’s Secret Menu to be rolled out over the next year on the KFC app,’ the chain said. The product on the menu will change every month – so dedicated diners are encouraged to keep checking back on the app. ‘Discover unreleased treats that have never seen the light of day – until now. 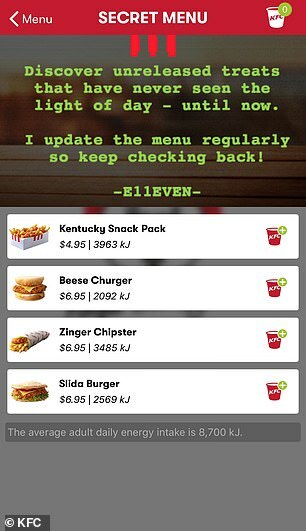 I update the menu regularly so keep checking back,’ the menu description reads. What is on the KFC secret menu? This is a regular burger with a Zinger fillet, cheese and mayo. In this case, the buns are flipped upside down. ‘Honestly, we’re not sure how, but it really works, trust us,’ KFC said. This is a ‘next level’ Twister with a Zinger fillet, fresh lettuce, cheese and sauce all wrapped in a tortilla and stuffed with golden chips. For anyone who wants a burger without the buns, the Slida is the perfect option for you. It is simply a Zinger fillet, smoky bacon, fresh lettuce, cheese and sauce all packed between two flatbread buns. This is the newest item to be added to the Secret Menu. The snack pack includes golden chippies, topped with Popcorn Chicken and drizzled with fiery supercharged sauce. 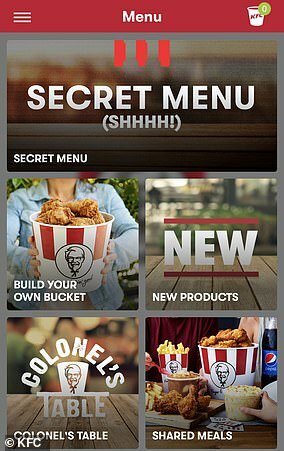 A KFC spokesperson told Daily Mail Australia last month: ‘As you know, The Colonel is famous for his secrets including his 11 herbs and spices, but yes we can confirm there’s a secret menu within the KFC app. 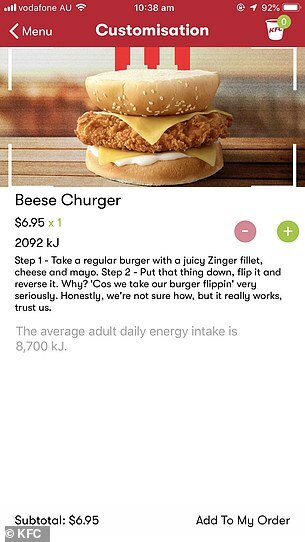 ‘It’s a secret menu for a reason, so we encourage Aussies to download the KFC app and get scouring. There’s a bunch of clues hidden in the website, app and on Facebook which will help uncover these never seen before KFC products. Among the selection of ‘secret burgers’ is the ‘Beese Churger’, which is a regular Zinger burger but the buns are upside down. ‘Step 1 – Take a regular burger with a juicy Zinger fillet, cheese and mayo. Step 2 – Put that thing down, flip it and reverse it. Why? ‘Cos we take our burgers flippin’ very seriously. Honestly, we’re not sure how, but it really works, trust us,’ KFC said. 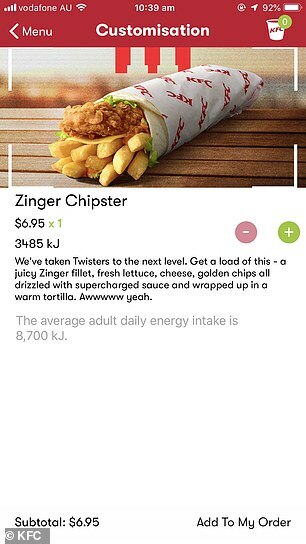 The next meal on the menu is the ‘Zinger Chipster’ after KFC recreated the iconic wrap by adding golden chips into the centre. ‘We’ve taken Twister to the next level. Get a load of this – a juicy Zinger fillet, fresh lettuce, cheese, golden chips all drizzled with supercharged sauce and wrapped up in a warm tortilla,’ the description reads. Finally if you’re looking for a burger without the buns, then the Slida Burger is the perfect choice for you. ‘Apparently low-carb burgers are a thing now so here’s our take if you’re all about that life,’ KFC said.